The meta description of your page has a length of 313 characters. Most search engines will truncate meta descriptions to 160 characters. 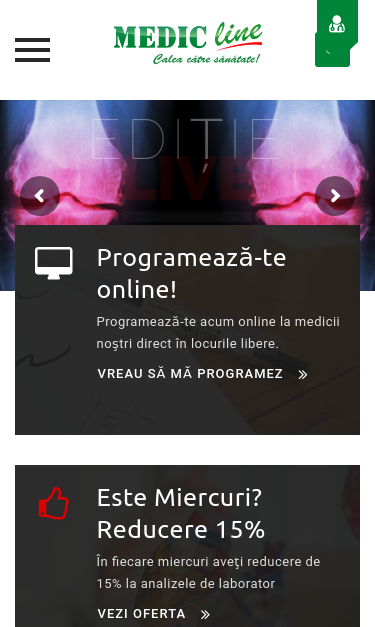 Clinica privată Medic Line vine în întâmpinarea dumneavoastră cu următoarele specializări medicale: Cardiologie, Dermatologie, Endocrinologie, Ginecologie, Medicină internă, Psihiatrie, Recuperare Medicală și Psihologie. Solicită o programare online, trimite rapid un mesaj și vezi datele de contact. Congratulations! The size of your webpage's HTML is 29.93 Kb and is under the average webpage's HTML size of 33 Kb. Faster loading websites result in a better user experience, higher conversion rates, and generally better search engine rankings. Congratulations! Your webpage is successfully compressed using gzip compression on your code. Your HTML is compressed from 175.75 Kb to 29.93 Kb (83% size savings). This helps ensure a faster loading webpage and improved user experience. Your website loading time is around 11.0 seconds and is over the average loading speed which is 5 seconds. https://medic-line.ro and https://www.medic-line.ro resolve to the same URL. Your website is successfully using the HTTPS protocol, but the SSL Certificate will expire in less than a month! Having an up-to-date certificate is an important security practice to ensure that your website is safe and provides trust, and any communication between the user's browser and your website (such as passwords, credit cards, or forms) is encrypted and private. Your webpage is using the canonical link tag. This tag specifies that the URL: https://medic-line.ro is preferred to be used in search results. Please ensure that this specification is correct, as canonical tags are often hard-coded and may not always reflect the latest changes in a site's URL structure. Solicită o programare în regim de urgenţă!